“We made lifelong friends with another family at FOCUS Family Camp! Families that include children with disabilities must plan every outing, vacation and trip carefully. Parents might never consider a camping trip because of their child’s medical or physical needs. So, each year, FOCUS Family Camps take families to Camp Twin Lakes in Rutledge, Georgia in August and to Camp Twin Lakes Will-A-Way in Winder, Georgia in October. 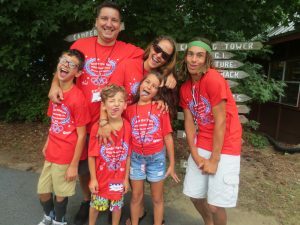 FOCUS families enjoy the activities at camp such as swimming, boating, putt-putt and archery and the activities that FOCUS plans such as art, talent show, drumming, and other fun. In 2019, Family Camp 1 is August 9 to 11, 2019 at Camp Twin Lakes in Rutledge, GA.
Family Camp 2 is October 4 to 6, 2019 at Camp Twin Lakes Will-A-Way in Winder, GA.